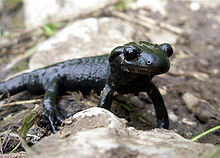 Salamandroidea is a suborder of salamanders, the advanced salamanders. The members of the suborder are found worldwide except for Antarctica, Southern Sahara, and Oceania. All members use internal fertilization. The female is fertilized by a spermatophore, a sperm-containing cap put by the male in her cloaca. The sperm is stored in on the roof of the cloaca until it is needed at the time of egg laying. The earliest known salamandroid fossils are from the Tiaojishan Formation. They are dated to the late Jurassic period about 157 million years ago. ↑ Miller, Jessica J. "Caudate families (newts & salamanders)". Livingunderworld.org. Archived from the original on 2007-10-16. Retrieved 2007-11-09. ↑ Sever, David M.; Stanley E. Trauth (1990). "Cloacal anatomy of female salamanders of the plethodontid subfamily Desmognathinae (Amphibia: Urodela)". Transactions of the American Microscopical Society 109 (2): 193–204. doi:10.2307/3226814.